The tarot is one of the many tools for your highest self. It is not witches, magic potions or spells - but a way to direct your inner intentions and push them to action. I believe transformation is already happening, you need the push. And, tarot is the push. Are you feeling like you are not fulfilling your purpose in life? Unsure on the next steps to take in your life? Needing to break free of habitual patterns and fears? Just like the saying “laying one’s cards on the table”, the tarot reading will be the map to what your day, months and years could be. 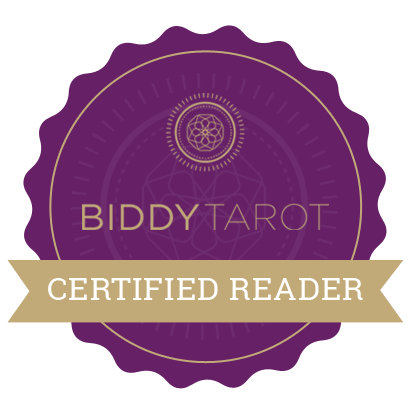 Acting as a directive tool, tarot reading also holds a space for one to honestly introspect their current self and intuitively take the step forward in their quest for transformation and clarity in all aspects of their life (business, career, love). It is the sign that you’ve been needing to see; only if you allow it to be. Now, it is your turn to take the wheel. Each reading is tailored around your specific question and never randomly generated. I truly hold that space for you, understanding, without judgements, your questions to communicate the message to guide you on your path. I feel the single or multi-use of these cards depend on every unique client's energy, questions, subconscious intention and my spirit guides directing me. Known as the first modern tarot card since 1910, this deck is profoundly symbolic - allowing little to no opportunity for other signs and language interpretation. I like the purity of this. The oldest surviving cards from mid 15th century, this set is a historical beauty and powerful in giving a complete visual reflection on the current and future path for my clients. A fundamental deck that brings alchemical and astrological references, this is better suited to invoke one's internal power and questions around his/her highest self. A variety of angel cards to peek into one's past life, to heal every area in your life or to understand your own being. Activating even more my psychic sense, I allow the guidance of spirit to help me guide you. This is a sacred honour for me to you.